A less obvious question, raised by baking with and reading Modern Art Desserts, from Blue Bottle Coffee pastry chef Caitlin Freeman, is, Is Cake Art? The book’s raison d’etre is right there on the cover: the Mondrian Cake she developed for the Blue Bottle outlet inside the San Francisco Museum of Modern Art. That cake, eight white velvet squares and rectangles — one yellow, one red, one blue — stuck together with a river of chocolate ganache, has brought her a lot of press. It looks like a Mondrian. It tastes great. They sell it right there at the museum. The appeal is not hard to fathom, but the baked good’s one-to-one relationship to the painting also makes the answer to my question an easy “No.” It’s not an interpretation; it’s a replica. And one I am not crazy enough to attempt (though Rose Garrett at SFist did). I vividly remember turning the corner into the exhibition, Thiebaud’s painting of gumballs in a machine to the left and his most famous confectionary painting Cakes to the right, and being overcome with the same warm happiness as wehen I first happened upon Display Cakes at SFMOMA. … [A]s I stood in front of Cakes, I declared that was what I would do with my life. In her original conception, that was making cakes and photographing them, “channeling my love for sweets into art.” Somewhere along the way to learning how to make cake, becoming a partner at the bakery Miette, and marrying Mr. Blue Bottle Coffee, the photography fell away, and the cakes became the life. So, when Blue Bottle was asked to run SFMOMA’s café, making Thiebaud cakes seemed like a no-brainer. At a 2009 preview for the museum’s Rooftop Garden, Freeman presented her homage to Display Cakes: a white, a pink with berry, and a lemon curd, each on its own pedestal. Like the Mondrain, these cakes are beautiful visual jokes. As Freeman continues to bake, the rotating exhibitions at the museum create constant new challenges. Robert Ryman gets a nice white square. Andy Warhol a pop-color gelée. 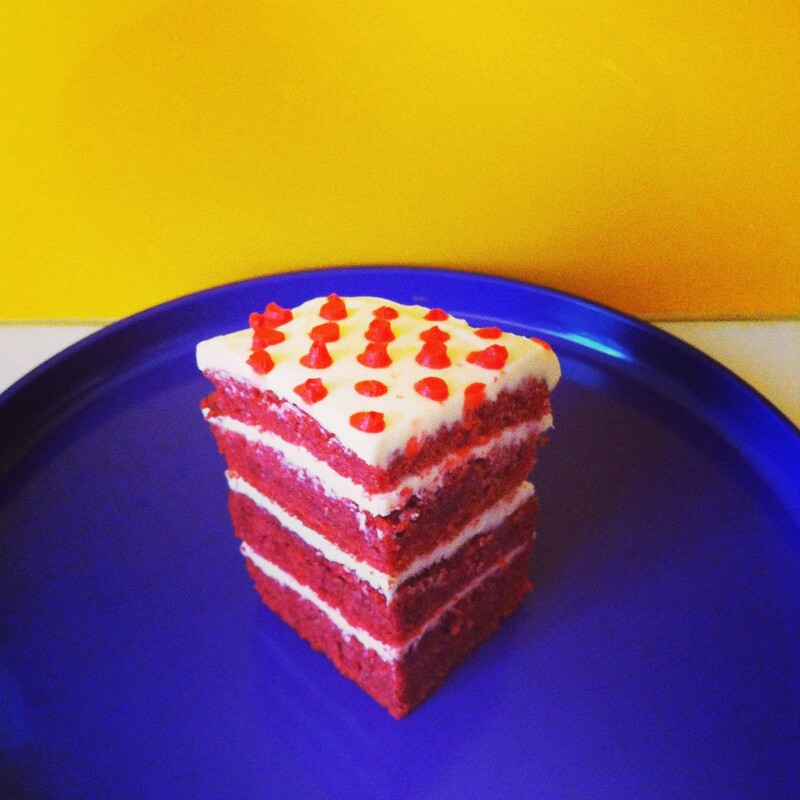 But how do you make Buckminster Fuller into a cake? I might have assembled sugar sticks into a geodesic dome or (as Freeman does with Barnett Newman’s zig-zag steel Zim Zum I, which she translates into sablé cookies and a pot of ganache) let people make their own. That’s not enough for Freeman, who decides that Fuller’s genius, and his collage for a Proposed Tetrahedral City set in San Francsico Bay, can best be expressed through hot chocolate, a pyramidal marshmallow, and a dusting of sea salt. And not just any sea salt. We hired a boat captain, donned the necessary rain gear and life vests, and charted a course to Buckminster Fuller’s precise location. Back at the kitchen, Leah slowly simmered the seawater until only flakes of salt remained. When we tasted the salt, I was surprised by how much it reminded me of San Francisco—somehow it captured the foggy, briny essence of our city. This is where I begin to wonder if Freeman hasn’t become an artist after all — a conceptual artist, tricking us, via sugar, into carrying out her instructions. It takes some kind of something to write, “But if you’re up for the challenge, making sea salt is really easy … Just be sure to collect water that’s clean and pristine.” If I have recently been inspired by Sol Le Witt’s retrospective at the Mass MoCA to do a wavy marker drawing on my own wall (instructions here), why should I be any less eager to attempt her Lichtenstein Cake, with its four layers, ninety-nine steps, and bright red Ben-Day dots? I pick the Lichtenstein because it seems easier than the Mondrian, and only requires me to purchase one outré utensil: a polka dot decorating stencil. Once that arrives (in the future, for reasons you will discover below, I may just hang it on the wall), I am ready to go. 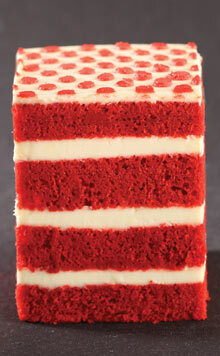 My goal is a four-layer red velvet cake, with cream-cheese frosting and a topping of cheery dots. Freeman’s inspiration is the right-most panel of Lichtenstein’s Rouen Cathedral Set V, where the sky is rendered as a screen of white dots on a red background. I did it, and I have to admit, the resulting tan mountain does have a delicate, granular texture different from any flour mix I’ve made before. I measure my other ingredients. I separate the six eggs (as another Freeman tester mentioned, she does not skimp on eggs, butter or cream). I beat my butter on low speed. Ready to add the sugar and salt, I reach for a measuring cup in my peripheral vision and … dump in the buttermilk. Disaster! Buttermilk was to follow sugar, egg yolks, and the first installment of the flour mixture. I realize now that I should just have emptied the buttermilk back out, and proceeded with the recipe in order. But I’m more of an all-in baker. I just add the sugar, egg yolks, and flour, and keep mixing, slowly adding the flour to the soupy bowl. It seems fine. Someday Freeman can explain to me why it is better her way. I then fold in six eggs whites, whipped separately, until the whole batter is uniform in color. Baking: Here’s where I learn something new. Freeman suggests testing for doneness by listening to the cake (how much more conceptual can you get?) “Remove the pan from the oven, set it on a wire rack, lower your ear to the cake, and listen. If you hear the cake snap, crackle, and pop, it needs a few more minutes in the oven.” This works: one of my cakes was slightly thinner, and it is quiet, but the thicker one pops. Back in it goes. After I cool the cakes and remove them from the pans, they go into the refrigerator for three hours, as instructed by Freeman. I spend that time whipping up a massive batch of cream cheese frosting: one pound of cream cheese, half a pound of butter, one cup of confectioners sugar. Having the ingredients at room temperature, and sifting the sugar (just once!) makes for perfectly smooth, billowy frosting. So far, so great. But it is always in the decoration that I meet my match. I could have made Freeman’s easiest recipe, the Bradford Cheese Plate, which is all assembly (and some homemade crackers). At food arrangement I am an expert; it’s frosting that remains my Waterloo. I get out a serrated bread knife and try to slice each cake into two equal halves. Since my knife is not larger than the cake, it gets a little lost in the middle, and I end up with one side where the cuts don’t line up. Freeman also says to shave the cake flat on top, and I skip that. It seems like such a waste of hard-earned cake! But my stack would have ended up much tighter if I’d trimmed it all to architectural dimensions. The frosting looks and tastes beautiful, but it is hard to manage. Afraid of running out, I skimp on the first tier, so I already know my white stripes will be uneven. I do brush each layer with what seems like totally unnecessary simple syrup: the cake is plenty moist and sweet on its own. Then I get to the top. It slumps slightly on the sides, but I figure I can even that out with frosting, as I aim for the level top Freeman deems necessary for even dot application. She doesn’t recommend a crumb coat — a thin first layer that seals in the cake — but I do. Crumbs adhere to my spatula at every pass, and picking them out just seems to make the situation worse. When I try to make a last smoothing pass, some of the frosting, to my horror, begins to come up like a sheet. I stop fussing and put the whole thing in the fridge overnight. The dots will have to wait. In the morning I take out the cake, looking shlumpier than ever. I try one more time to even out the top. Then I get out my giant dot screen and press it gently down. Because the cake isn’t level, I have to press harder at the edges, and I think this is my big mistake. Tip: Get a friend to help you with “gently.” I take a glob of red frosting (tinted with the rest of my bottle of food coloring) and smooth it across the screen, covering the whole cake through the plastic. Then I begin to peel the screen off… and the frosting comes with it! After all that mixing and fluffing and spreading, I can’t believe my eyes. My dots and my background are curling up, leaving red, bare cake. I take the spatula and try to coax the layer off. It comes off, but looking the worse for wear. I have one corner of nice high red dots, a little off-kilter due to the curve of my cake, and the rest is a shambles. Should I have sprayed the dot screen with cooking spray? Let the cake warm up more? I don’t know. Maybe you do? As it is, it’s a magnificent ruin, high and tight and looking like it was put through a wringer. I cut one piece from the nice side and take a photograph. In the book, Freeman shows the cake as a single, totemic slice, dots springing up from a thin (should it have been thinner?) white top, four almost-even layers of cake below. I wonder if the rest of hers didn’t turn out so great either. Who eats all the unphotogenic edges? I keep staring at the cake, frustrated and grumpy. I don’t even want to eat any now, but I know my kids will. I could just take that offset spatula and swirl the dots into something new. Or I could admire the textural effect of the rumpled surface. From certain angles it looks a little like a piece of crumpled newspaper, very close up. Sigmar Polke made a painting career out of messed up dots. Can I call my cake an interpretation? It’s not art, but it might be a process sketch.